The Transformational Mandala of the Five Tathagatas or Dhyani Buddhas is a wonderful expedient vehicle in which to partake, embody and actualize the Higher Wisdom Sambhokayic Planes contained therein. If one diligently meditates with these Dharmadhatu Wisdom-Bodies then the influence of the karmadhatu will begin to wane and will not hinder one from making a smooth Bardo Transition into the Luminosity of the Dharmāta. 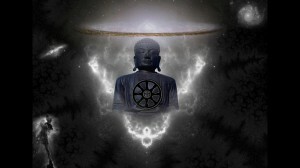 Adibuddha Samantabhadra is the Wisdom-Buddha-Supreme as he is the Primordial-Dharmakayic Source from which the Five Tathagatas emanate; in light of this Samantabhadra also emanates from the Dharmamegha Chakra (located on top of the crown)—the Dharma Cloud and the place of Right Release of Noble Wisdom from the Nirvanic Kingdom of Self, the Dharmakaya. We have been circumabulating round and meditating on the Four-Fold Wisdom Bodies whose center is Vairocana. Vairocana is a composite of the other Four Wisdom-Dhyani Buddhas and is the Illuminating Source and Center of them all. Yet, within himself Vairocana is truly panoramic in stature; his center is actually here, there, everywhere and yet nowhere simultaneously; in this sense, Vairocana transcends the Skandha of Form. Vairocana’s color is White, symbolic of the illuminating center of a prism from which the other Wisdom-colors emerge. He is a perfect embodiment of the Dharmadhatu’s Element of Truth. Vairocana’s Sacred Symbol is the Dharmachakra—signifying his central-role as Advocator and Progenitor of the Sacred Dharma. His Dharmachakra Mudra seals this teaching-position for all time. All ignorance (avidya) is purged and incinerated under Vairocana’s Illuminating Gaze; in this vein he is associated with the Dragon Eye of Tathata Chakra (center of the forehead) that sees the difference between Truth and Illusion—this is the Blessed Dharma Seat of Wisdom Itself. He is the very hub of the Tathagata-family and his beloved Dharma-Wheel forever turns as a beacon of Unborn Light that forever enlightens the way for those who follow wholeheartedly the Noble Path of the Buddhadharma. This entry was posted in The Lankavatarian Book of the Dead and tagged Bardo, Bardo 3, Dharmachakra, Dharmamegha Chakra, Truth, Vairocana. Bookmark the permalink. Your description of the Five Buddhas is very close to the real thing. Impressive. Once these awesome spiritual “configurations” of the Unborn Mind kicks in the door of the weakened body-consciousness, one experiences incredible visions and other spiritual treasuries (remember your saints from the christian history and their encounters with the ineffable light of the absolute). I wrote the entire Dharmakaya sutra based on my first union/communion with them/IT. The juice (empowerment) from them kept me up three entire days and nights in maha-samadhic trance. Keep up the good work. It will truly serve future cyber “buddhist-archeologists”, digging in the vast receptacle of the growing digital noo-sphere for good dharma from the past. As the research in the quantum computing becomes greatly developed the coming 20 years and the synthesis between discoveries in integrated digital consciousness fields and spiritual consciousness fields will astonish the scientists, your work will emerge from seemingly nowhere and shine as one of the more interesting and scientifically verifiable topics for the “spirit-scientists” of that coming era. Words and apps like suprapositionalMind/field and pseudo-bardo simulations will become very common. Thank-you. So wonderful to hear your account of how they were a source of inspiration during your composition of the marvelous Dharmakaya Sutra. Bodhichild, I’m still checking in on your blog and the Zennist’s almost on a daily basis. You guys have definitely ‘kicked’ it up a notch. Really enjoy your videos, and have shared some and will continue to share on Facebook.